12 Nov 1997: Pete plays a backhand volley during his straight sets victory over Greg Rusedski of Great Britain in the second round robin match at the A.T.P. Tour World Championships in Hanover, Germany. Eight tournament victories, two Grand Slam titles and a fifth straight year as the world's No. 1 player. What else is left for Pete Sampras to accomplish in 1997? Winning the Davis Cup, that's what. 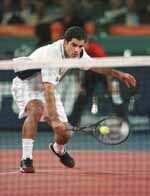 Pete Sampras is tennis perfection -- that ideal blend of flawless technique and positive personality the game has longed for many a season. His easy-going nature and aggressive serve-and-volley style win him fans as well as Grand Slam titles. Pete continuously demonstrates why he has been the undisputed number one player in the world for five straight years. Sampras, who has won 10 Grand Slam crowns, joins Borg as the only player to win at least one Grand Slam title in five straight years. He has captured four Wimbledon titles, four U.S. Opens and two Australian Opens. 1997 marked his 10th season on the ATP Tour. Want to know Pete Sampras' win - loss record? How about an ATP Tour Update? Want to know how fast Pete's serve is compared with the rest of the tennis world? Check the serve speed rankings. Who do you think is the top ranked player in the tennis world? See how many points Sampras has. Check out all the ATP Tour Facts and Figures. Find out how long and when Pete has been ranked number one. Looking for something specific in Pete's site but don't know where to begin looking for it? Click here for a summary of the site. Win a trip to the Australian Open!